GRIN2A. This is the Epilepsiome page for GRIN2A, a recently described gene associated with a wide range of neurodevelopmental disorders, including idiopathic focal epilepsy. GRIN2A encodes for a subunit of the NMDA receptor, and is affected by many different types of mutations, particularly de novo, although familial mutations have been described. In a nutshell. GRIN2A is a gene for epilepsy-aphasia syndromes. It codes for the alpha subunit of the NR2 subunit of the NMDA receptor. 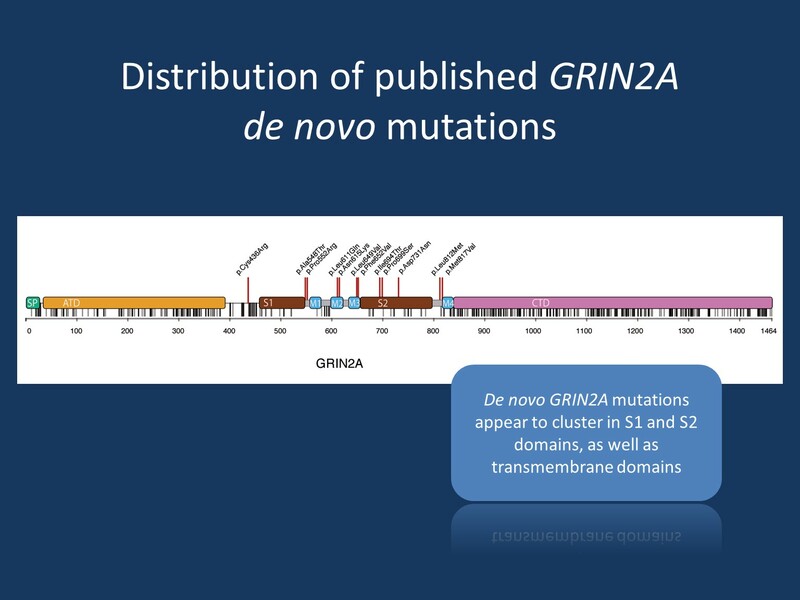 The mutational mechanism is through haploinsufficiency and both mutations and deletions involving GRIN2A have been described. It is currently poorly understood how GRIN2A haploinsufficiency results in genetic epilepsies that primarily show epileptiform discharges over the centro-temporal regions. Phenotypes. The currently-known spectrum of phenotypes associated with genetic alterations in GRIN2A is very broad and ranges from (nearly) unaffected to severe encephalopathy. Unaffected individuals: Some patients inherited a putatively or likely pathogenic GRIN2A mutation from an apparently unaffected parent. It currently remains unclear whether those unaffected mutation carriers might have subclinical phenotypes (such as EEG abnormalities in childhood). Furthermore, some putatively pathogenic GRIN2A mutations might in fact only predispose to IFE rather than being true causative mutations. Focal epilepsy with centrotemporal spikes: This spectrum of epilepsy comprises classic Rolandic epilepsy (RE), atypical benign partial epilepsy (ABPE), continous spikes and waves during slow-wave sleep syndrome (CSWS) and Landau-Kleffner syndrome (LKS). Epilepsy aphasia spectrum: This spectrum shows phenotypic overlap in particular to CSWS and LKS. Severe epileptic encephalopathy: Only a few cases have been reported with severe developmental delay and intractable epilepsy. Mutations in GRIN2A are frequently observed among severe phenotypes of seizure disorders (approximately 20% in patients with LKS and CSWS) and appear to be less frequent in the common and benign Rolandic epilepsy (approximately 5%). All types of mutations have been described: missense, truncation, splice site mutations, as well as structural rearrangements, such as copy number variations and disruptions. Both de novo and familial mutations are known. However, de novo mutations appear to cluster in functionally important S1 and S2 domains as well as transmembrane domains and usually result in rather severe phenotypes. GRIN2A encodes the glutamate-binding GluN2A subunit of the NMDA receptor in the excitatory synapsis. The assembly of this heterotetrameric receptor follows a specific temporo-spatial expression pattern. For all mutations investigated so far, the observed pathomechanism resulted in a gain of NMDA receptor function by either loss of Zn2+ inhibition or increase of glutamate sensitivity or reduction of Mg2+ block. As truncation mutations result in similar phenotypes as gain-of-function missense mutations, it is hypothesized that a lack of GluN2A expression due to truncation and haploinsufficiency is compensated by an increase of GluN2B expression. Thus the composition of the heterotetrameric NMDA receptors is changed towards more GlunN2B. As GluN2B is known to have a longer channel opening time the altered receptor assembly will likely result again in a gain-of-function. The initially observed tendency of truncation mutations resulting in more severe disorders and missense mutations rather leading to milder phenotypes, could not be confirmed when looking at larger cohorts of GRIN2A mutation carriers (Strehlow, Heyne, Lemke 2015). For the time being, it remains unclear what additional factors might modify the severity of phenotypes even within family members carrying the identical GRIN2A mutation. Memantine is a specific NMDA receptor blocker that had been shown to normalise NMDA receptor function in vitro. Application of memantine in a patient with GRIN2A encephalopathy resulted in marked reduction of seizure frequency and other improvements. However, this observation on a single patient still remains to be confirmed on additional cases. Different research projects are ongoing to further elucidate the nature and impact of genetic variation in GRIN2A.